Here and on I posted pics from the Chicago Balaji Temple and the Durga Devi Shrine within the Atlanta Temple. These are both very elaborate temple structures. However, not all worship occurs in such embellished temple complexes. On a regular basis worship takes place at the simple home altar. Routinely folks worship at small road side shrines in rural India. They offer an opportunity to slow down from our hectic pace, take off our shoes and give thanks. 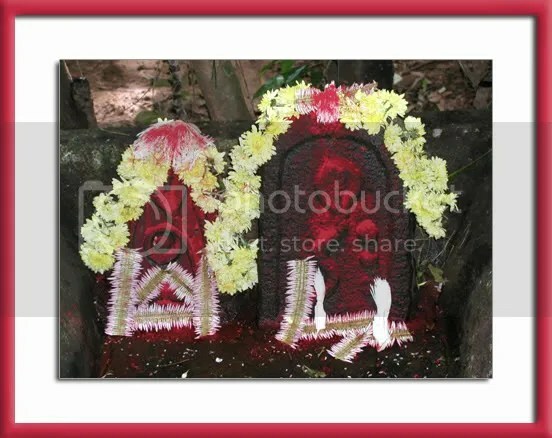 Near my ancestral home along coastal Karnataka, we prayed at an outdoor shrine to Naga, the snake deity. In a small clearing in someones backyard, was a simple cement pad on which were consecrated two stone tablets. 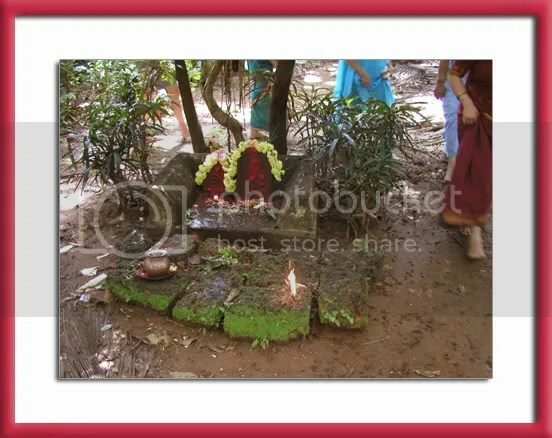 A few, roughly hewn red sandstone blocks act as an altar, which even collects moss during the monsoons. As part of the puja (or service), the priest poured water over the tablets, placed flower garlands and sprinkled vermillion. A bundle of hand-made cotton wicks, soaked in oil, were lit and waved in front of the deity in a clockwise direction. This represented aarti, an offering of fire and light. Following the aarti, family members walked clockwise around the shrine (see pic) in pradakshina. A dried palm frond on the ground in front of the altar, formed a biodegradable mat to stand on.